“But wait!” I hear you asking, “What was the dessert was for June?” See- I knew you were paying attention. Life got busy and I never did write about what our one dessert for the month of June was. So what about June? Well, for the first time, and by special request, we had our first non-homemade dessert of the year. To celebrate Father’s Day we went- as we have for the last few years- to A&W. My husband Steve adores A&W. 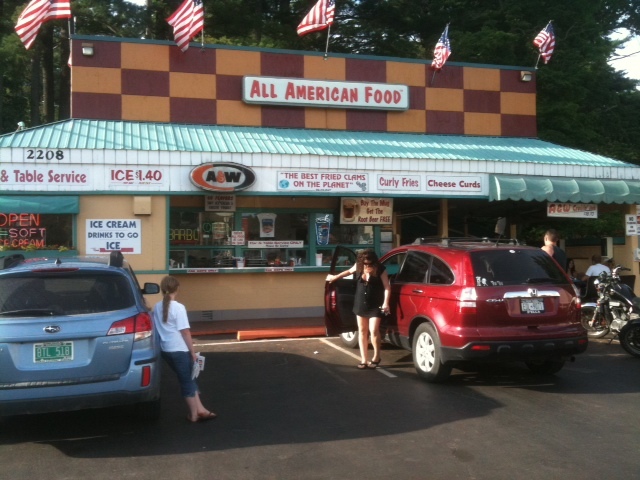 A few years ago when he discovered that there was an A&W in Lake George- a scant 45 minutes away from our house- and that it was a nifty car park one with window trays and everything- well we had to go eat there! Right away!! Consequently A&W is the only “fast food” restaurant our kids are familiar with. They don’t even have indoor seating- if you’re like us and choose not to eat in your car they have picnic tables. Consequently, they are only open for the oh-so-fleeting and ever-so-touristy Lake George summer. Just as well. You can’t eat food like that very often- retro or not- without feeling like a parade float. But we usually manage to amble over there a few times per summer; obviously, this year would be different. But I almost balked when Steve suggested it for our monthly treat… oddly enough, I think in the back of my mind I just assumed I would make all the monthly desserts this year. However, as of June, Steve was the only one of our family who had yet to pick a dessert. And it was Father’s Day. How could we refuse? I am happy to report that our one and only fast food meal of the year was a success: there were burgers with “special sauce,” onion rings and french fries, even a chicken nugget or two. The girls had games on their colorful meal bags to entertain them which was entirely unnecessary since: a. )the waiting time for our meal seemed to be about three minutes, b. )the food comes in the “meal bag” (should I eat? Or play?) and, c.)they were far too busy marveling at the novelty of having exotic delicacies like ketchup and juice for the first time in six months to require further entertainment. 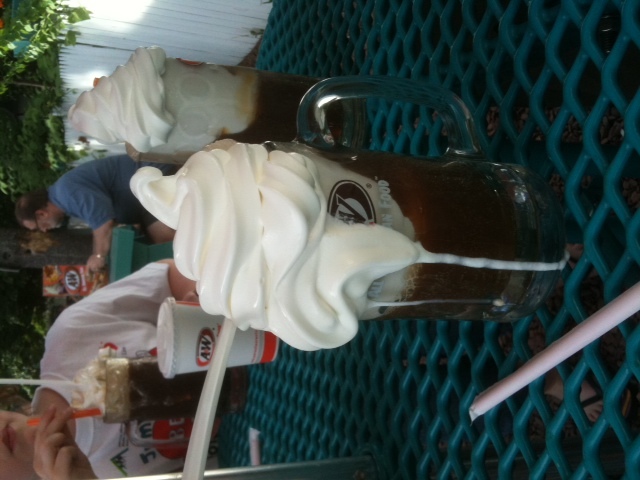 The piece d’ resistance at any A&W of course, is the root beer floats: Ta DA! Our official June dessert. All of us got one but Ilsa, who was pining away for an ice cream cone instead. Now, after six months drinking nothing but water and milk, you can imagine what a sensory shock root beer in a frosty glass with drippy, swirly vanilla ice cream pumped into it would be… pretty much the gastronomical equivalent of taking an Amish Family to a Las Vegas burlesque show. Wow, it was good. Wow, it was s-w-e-e-t.
Later, when at last Ilsa got to choose her small soft serve ice cream cone- her first ice cream cone of the year, mind you, what flavor do you think she chose? Bubblegum. Bubblegum! She promptly pronounced it “delicious,” and offered me a lick so I could silently pronounce it “abominable.” So sickly, fakey sweet with that most artificial of aftertastes… oy! Talk about going from one end of the spectrum to the other. And Steve? He was one happy dad. Who knew root beer could do all that? Have not had a chance to keep up with your blog lately, it sounds like a lot has been happening! I’m a little puzzled by this entry – I had a look at the A&W website and I didn’t see anything so unusual that you’d drive 45 minutes to visit one. What am I missing? Possibly the root beer itself, which is not a beverage available in Australia. We have sarsaparilla but apparently the taste is very different. You are currently reading A Year Of No Sugar: Post 64 at Eve O. Schaub.